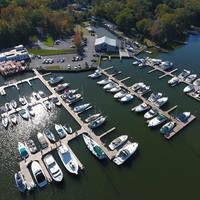 Curtis Bay is located off the Patapsco River in the city of Baltimore about 28 miles from Annapolis (by water) and 50 miles to the southeast of the Chesapeake and Delaware Canal. Curtis Bay eventually turns into Curtis Creek past Walnut Point and a set of twin bascule bridges that each have a closed vertical clearance of 40 feet (operating on a restricted opening schedule). Curtis Creek is home to the U.S. Coast Guard YARD, a large facility that builds, repairs, and refits a large portion of the vessels that the Coast Guard uses for daily operations. Two hundred eight 41-foot Utility Boats (the most familiar of all Coast Guard patrol vessels) were built at this yard between 1973 and 1983. 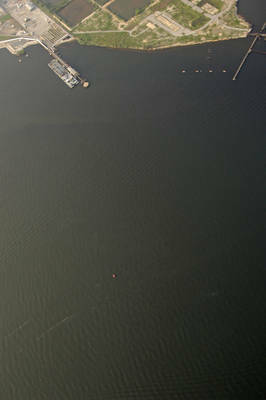 The image above is a view from the west looking east over the opening of Curtis Creek at the Patapsco River. 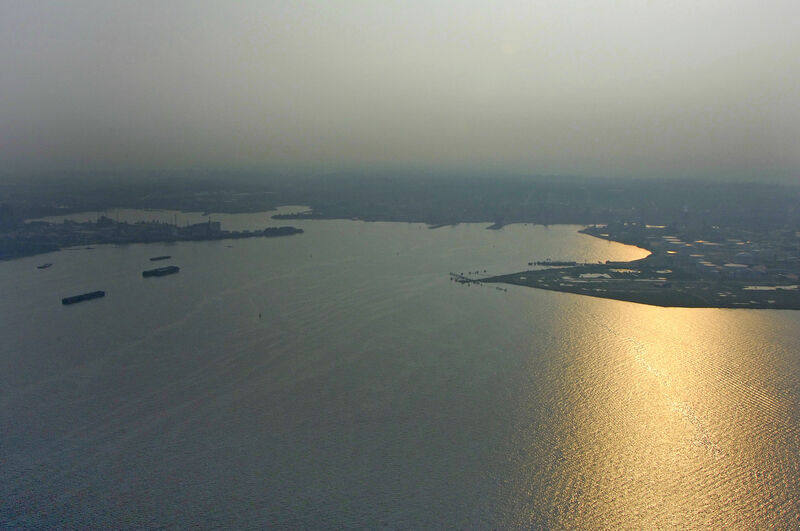 In the distance through the haze, the Francis Scott Key Bridge (185-foot fixed vertical clearance) can be seen. 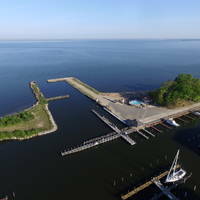 On the left (north) side of the inlet is Fishing Point, while to the right (south), where the loading dock can be seen, is Leading Point. The tree-covered Sledds Point is visible lower right. Closer down in the lower middle portion of the river, a sharp eye can spot the series of flashing red and green buoys that make up the Curtis Bay Channel. 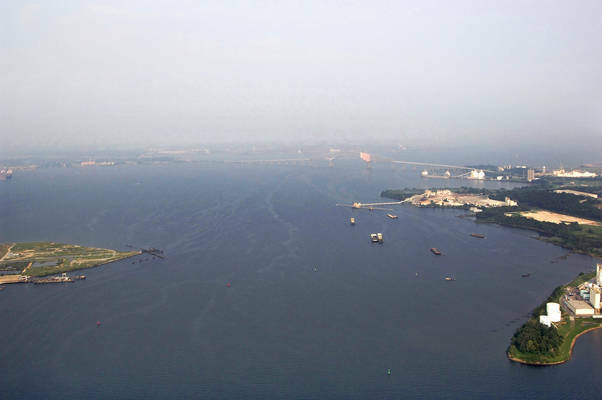 Curtis Bay is approached from the east via the Patapsco River northwest of the Francis Scott Key Bridge. Once you have cleared the Francis Scott Key Bridge northwest bound, set a course to intercept flashing green buoy 1CB, which is located near waypoint N39 13.189 W76 32.108. From here, head to the west-northwest to intercept the following line of buoys: Flashing green buoy 3, flashing red buoy 4, flashing green buoy 5,flashing red buoy 6, flashing green buoy 7, and flashing red buoy 8 at the freight dock turning basin. 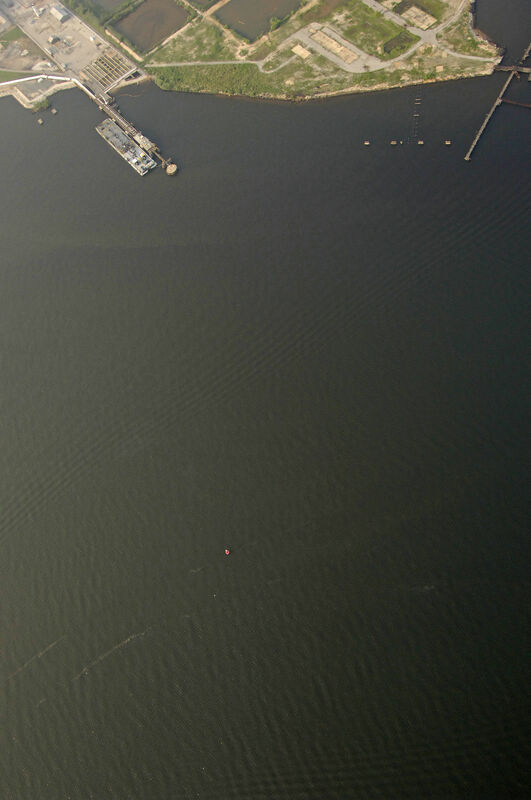 Despite the commercial traffic, anchorage can be had in a few select places along Curtis Bay and Creek, with the caveat that there are hundreds of years worth of shipbuilding debris on the bottom of both bodies of water. You wouldnt be the first person to lose an anchor if you did; proceed with caution. No reviews yet! 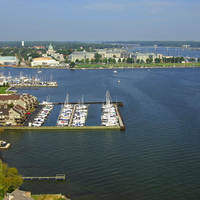 Be the first to write a review of Curtis Bay Inlet.